Passion flower helps your body to relax and improves sleep. It can also be used for making tea and it can induce lightly hallucinating effects when used in excess. Earlier it was used as medicine against nerve pain and restlessness. Also, it was used as a sedative. Nowadays, it is principally used for relaxation. So, in case you are looking for more relaxation and a better sleep, then Passion flower extract is definitely a must. Passion Flower (Passiflora Incarnata) is a herb that gives relaxation. Passion flower improves relaxation and also enhance the quality of your sleep. At high doses, it can be lightly hallucinogenic. Can improve quality of sleep. At high doses, it can be hallucinogenic. Is being used as (relaxing) tea. Passion flower is an MAO inhibitor. People that have a lot of experience with the use of psychedelics also use this to enhance effects. In certain cultures, the passion flower is used to treat nervousness. When consuming this powder in high quantities, the effect can be compared to that of cannabis. The passion flower was originally used by the Maya en Aztec people. It was used as medicine against nervous pains and restlessness. The Mayas also used the passion flower as sedative and blood purifying medicine. Add 3-4 grams to a cup of boiling hot water. Let it steep for 30 minutes. You can now drink the tea. It is recommended to refrain from driving a car and operating machines after using it. Do not use when pregnant and/or breastfeeding. 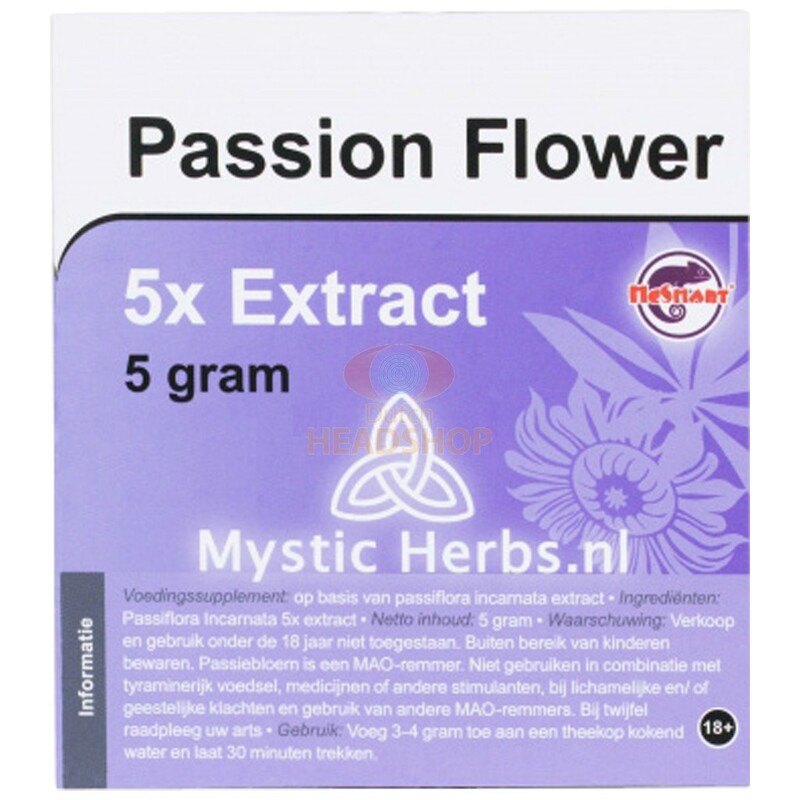 Passion Flower 5x extract contains 5 grams.